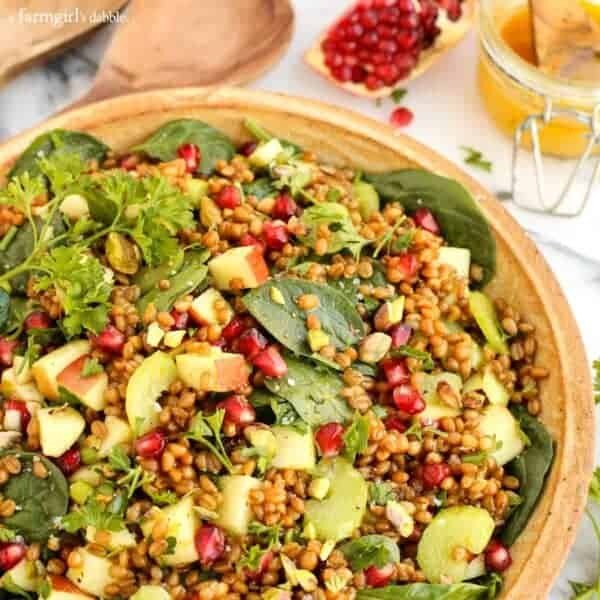 This Wheat Berry and Spinach Salad with Orange-Curry Vinaigrette is perfectly beautiful for any holiday table! The Upper Midwest has been experiencing such a beautiful fall. We’re past the mid-month mark for November and I haven’t even put on my winter coat yet. Yes, I’m layering up on the days that are cooler, but wow, what a gift! As I look at our calendar and all its busy-ness over the next number of weeks, it’s evident that the holiday season is upon us, even if our weather pattern doesn’t seem to fit the norm. I’ve been emailing and texting with Mom and my sisters this past week, trying to get a plan together for Thanksgiving. And I don’t know about you, but one of the dishes I most look forward to at any Thanksgiving table is one that is fresh and bright and colorful, and on the lighter side. This traditional meal can end up feeling very heavy, and might I add “brown”? Here’s a wonderful little salad for you, just in time for your own holiday menu planning. 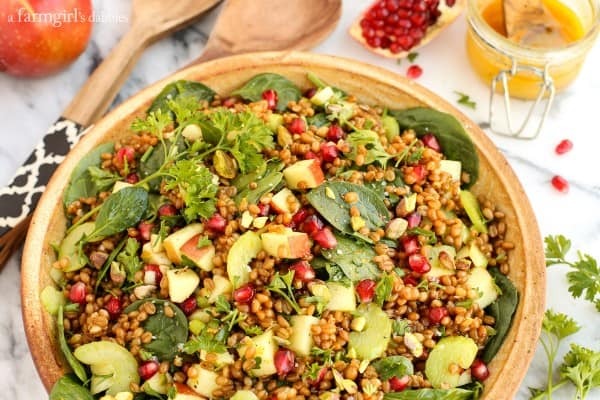 Wheat Berry and Spinach Salad with Orange-Curry Vinaigrette. It’s not only pretty to look at, but its flavor is outstanding. It’s a contrast to brown and savory, everything your upcoming holiday menus are begging for. *This post is sponsored by Dole. 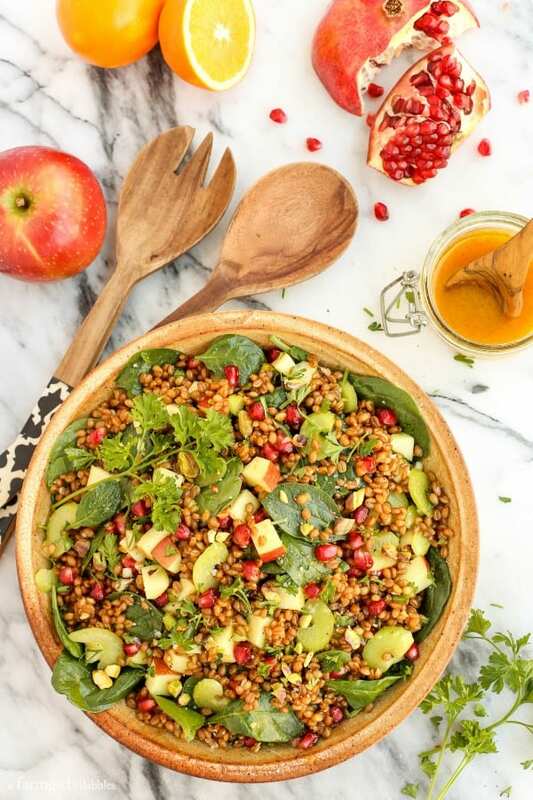 The wheat berries in this newest salad recipe offer whole grain goodness, and are soft and chewy, deliciously nutty in flavor. 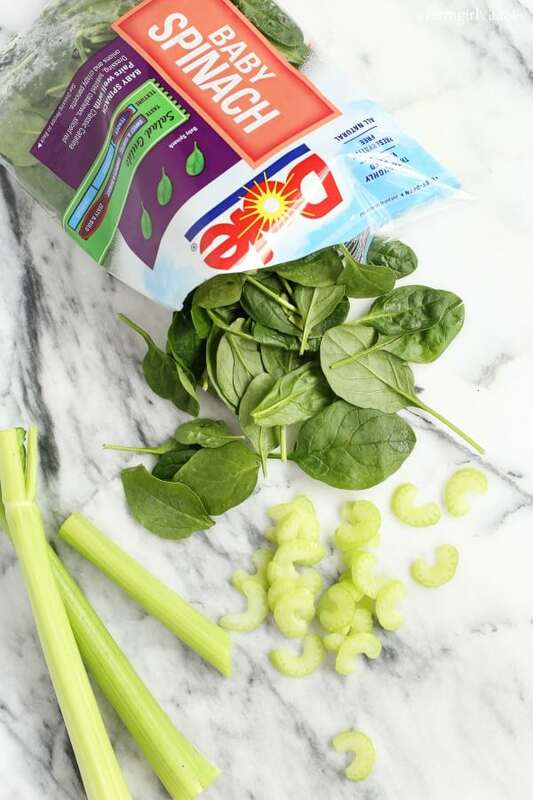 They’re folded with bright baby spinach and thin slices of crisp celery, both from Dole. When I visited the Dole Nutrition Institute near Charlotte, NC recently, I was introduced to their new Premium Celery Hearts. This variety of celery is exclusive to Dole and offers a milder taste, a snappier crunch, and a less-stringy texture. Dole’s consumer testing panel chose this variety 9 to 1 over competing celery brands. And personally, I’m one of those consumers who would rather eat this variety too. I often like to incorporate the flavor of celery into dishes by adding it in chopped form, but I don’t find it particularly enjoyable to eat fresh celery sticks, just because of the overly stringy quality. With these new celery hearts, I can happily say that celery has found a new home on our fresh relish tray. Curry. Dontcha just love it?! When I uncap the little container of sweet curry in our kitchen, all the little noses in the room start sniffing, and the outer corners of lips turn up, smiling. Curry’s scent is warm and intoxicating. It gets us every time. 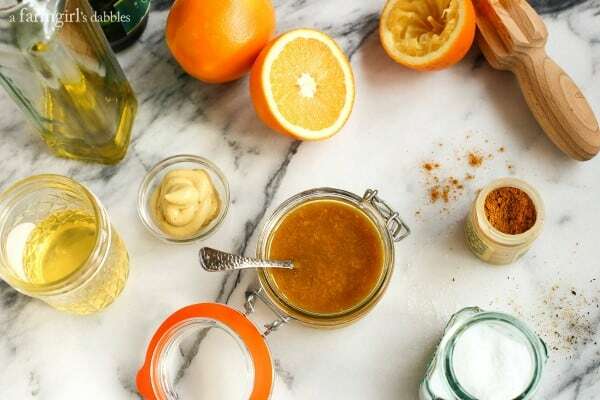 The vinaigrette that brings this salad together, hugging every morsel with its bright warmth, is created mostly from the flavors of sweet curry and bright, fresh orange. It’s a beautiful combination. I love all the different textures in this salad. Chewy wheat berries and tender spinach are folded playfully into the contrasting crunch of pistachios and fresh celery, apple, and those sweet little pomegranate jewels. It’s a festive looking dish, perfect for the holidays. I also wanted to invite you to join me for a Facebook Chat with Dole. 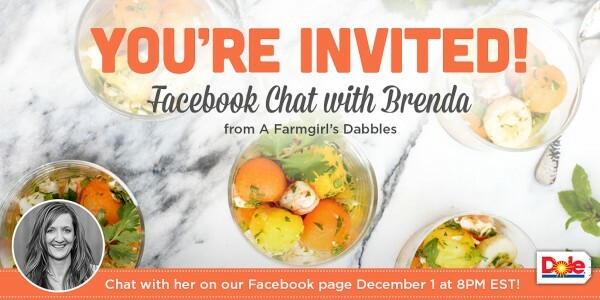 On Wednesday evening, December 1st, I’ll be hosting this little gathering to talk about fresh fruits and vegetables. To find me, just head to the Dole Facebook page at 8:00 pm EST on December 1st. See you then! In a small bowl, whisk together all vinaigrette ingredients and set aside. Add cooled wheat berries to a large bowl and drizzle 1/3 cup of the prepared vinaigrette over the top. Fold a few times to combine. Sprinkle with kosher salt and ground black pepper, to taste. In a small bowl, fold together apple pieces and orange juice to coat evenly and then add all to the wheat berries. Next add the green onions, parsley, celery, and pistachios. Fold to combine. Then gently fold in the spinach, using as little or as much as you like. Place salad in a serving bowl, sprinkle with pomegranate seeds, drizzle with a bit more of the vinaigrette, and add a little more salt and pepper, if desired. Serve additional vinaigrette on the side. This post is sponsored by Dole. I am partnering with them this year to bring you delicious new recipes bursting with fresh fruits and veggies. All opinions are 100% my own, as always. Thank you for supporting the brands that help make this site possible!